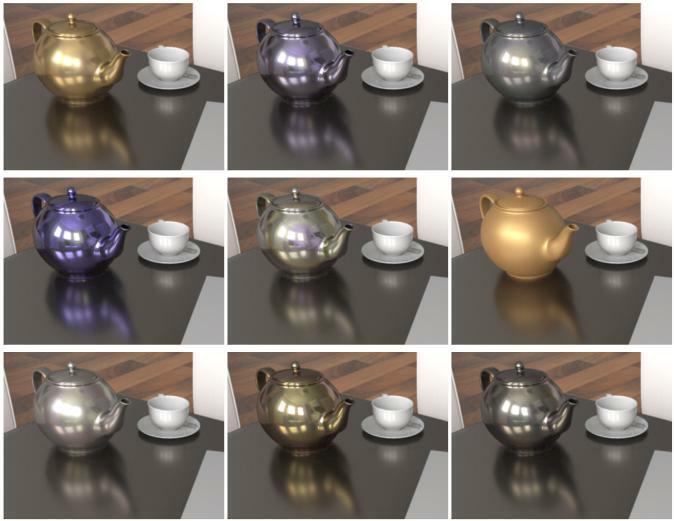 Abstract : A popular approach for computing photorealistic images of virtual objects requires applying reflectance profiles measured from real surfaces, introducing several challenges: the memory needed to faithfully capture realistic material reflectance is large, the choice of materials is limited to the set of measurements, and image synthesis using the measured data is costly. Typically, this data is either compressed by projecting it onto a subset of its linear principal components or by applying non-linear methods. The former requires many components to faithfully represent the input reflectance, whereas the latter necessitates costly extrapolation algorithms. We learn an underlying, low-dimensional non-linear reflectance manifold amenable to rapid exploration and rendering of real-world materials. We can express interpolated materials as linear combinations of the measured data, despite them lying on an inherently non-linear manifold. This allows us to efficiently interpolate and extrapolate measured BRDFs, and to render directly from the manifold representation. We exploit properties of Gaussian process latent variable models and use our representation for high-performance and offline rendering with interpolated real-world materials.